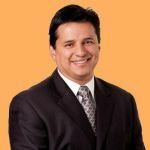 Communique Conferencing’s enterprise-grade, cloud-based Virtual Benefits Fair Platform functions like a traditional off-line employee benefits fair translating exhibit halls, booths, presentations and networking into an online environment. 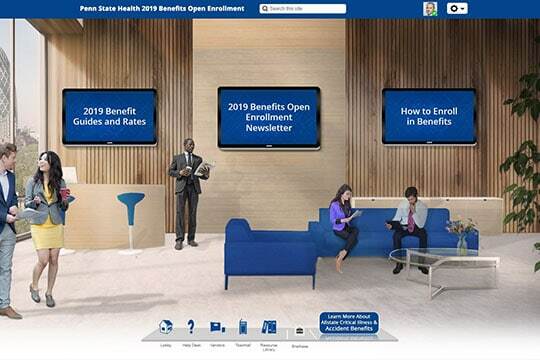 Employees, and their spouses, can access information from any device, ask questions, engage with benefits representatives and connect directly to your open enrollment website. 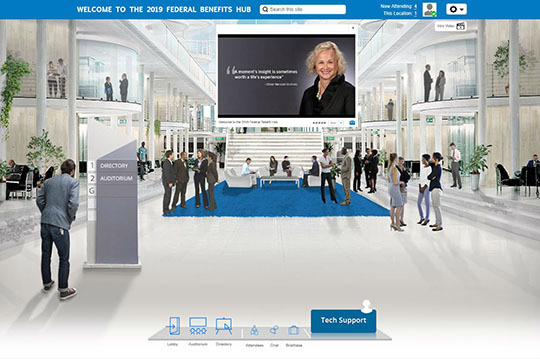 After logging into the virtual benefits fair attendees enter a fully customizable virtual lobby where a video greeter can welcome them. On screen hotspots provide entry to the Theater, Exhibition Hall, Resource Center and Networking Lounge. Consistent navigation at the bottom of the screen provides additional functionality and shortcuts. Choose from dozens of design templates or upload any image to create a completely custom lobby or room design to reflect your brand and goals. 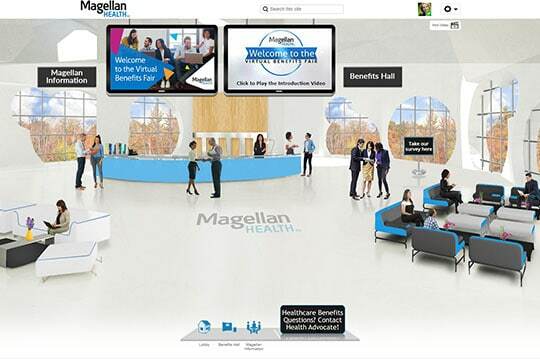 The Exhibit Hall gives attendees the ability to browse benefits supplier booths, chat with a representative, download documents, link to webpages, and watch video’s. 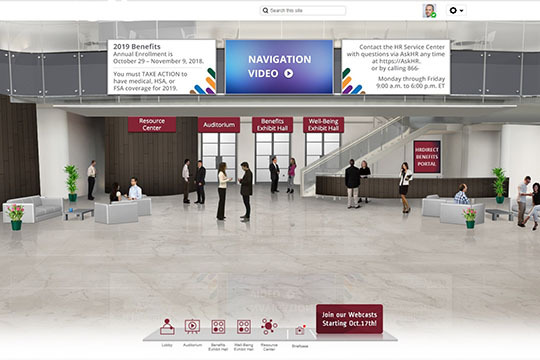 An exhibitor directory makes it easy to locate specific booths all with a click of a mouse. 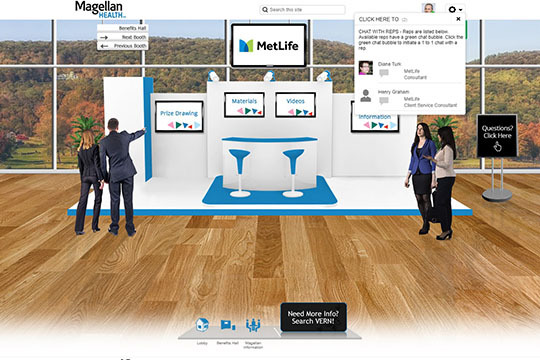 Choose from dozens of pre-designed booth templates or have our team create any custom design. 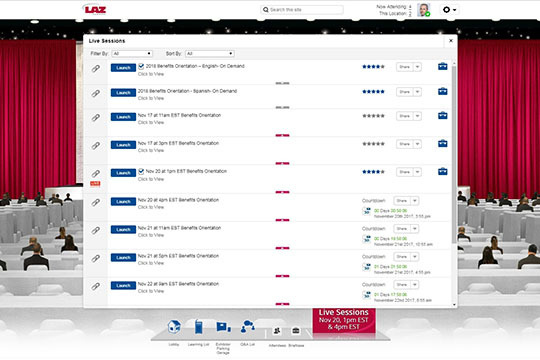 Vendors can add their company logo, upload documents, videos, links to webpages, surveys, and prize giveaways. When a visitor enters a booth, booth reps receive an alert. 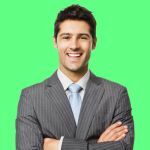 Attendees can chat live with a representative or optionally by Webcam. 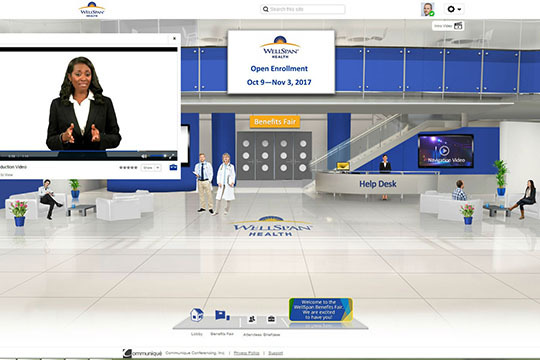 Employees can visit the virtual theater to attend live and on-demand town hall presentations from HR leaders. Attendees can participate in live Q&A. Tools are also available to search and bookmark content. 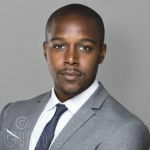 Use Communique integrated webcasting service to deliver live, semi-live or on-demand presentations to audiences on any device. Alternatively, you can link to any 3rd party webinar technology such as Zoom, GotoWebinar, WebEx, etc. 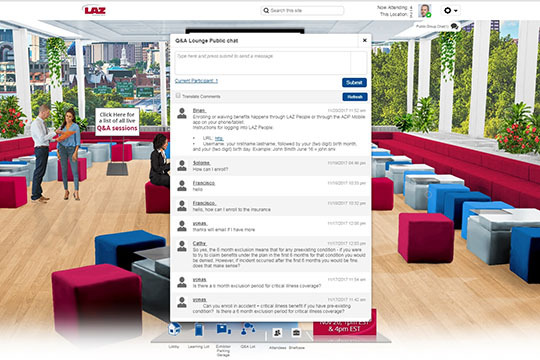 The Networking Lounge or Communications Center offers networking features including scheduled discussions, message boards, discussion forums, message center to send/receive messages and group chat. 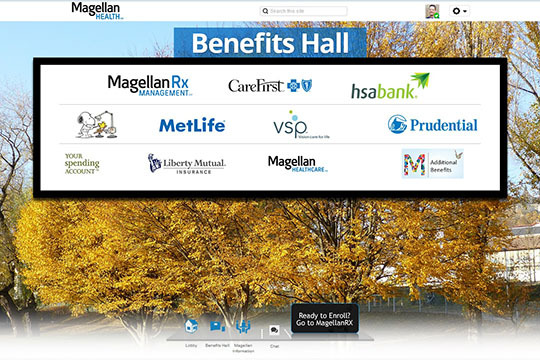 A central repository of virtual benefit fair event content including; videos, benefits documentation and links to web pages with search and bookmark tools. 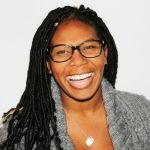 The Resource Center can include links to your annual enrollment guides, enrollment FAQs as well as a sign that links to right to your open enrollment webpage. Drive attendee behavior (visit booths, download materials, watch videos, attend webcasts, chat with reps, find hidden items, etc.) and add an element of fun using our powerful gamification feature. 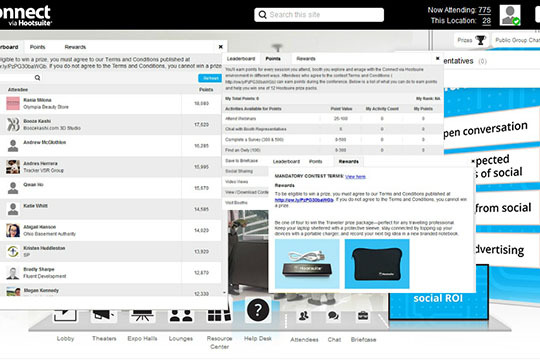 Assign points for activities, offer prizes and display a real-time leader-board.